Caldensity Black label an All In One product for bone, joint. hoofs. heart. attitude an overall program for helping to keep your horse healthy. For about $2.00/day, CalDensity® can eliminate dramatic amounts of your operating costs by reducing your vet costs and need for additional supplements. CalDensity® contains organic calcium. In addition, it was shown to be toxic free and imbalance free. Our Formula is a stabilized rice bran base, which is an essential aspect of our product. 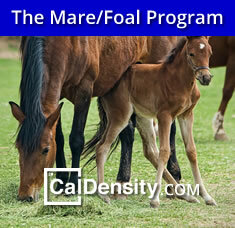 CalDensity® has NOT been steamed or heated* like other pellet formed compound feeds. *Heat and steam can kill many of the key nutrients and compromise potency. I have been using CalDensity extensively for over nine years now. In that time, I have seen superior results using this product in conjunction with my medical and surgical treatments. CalDensity is the primary product I recommend to our surgical patients to ensure a rapid return to training and racing as well as it's continued use to maintain soundness post surgically. 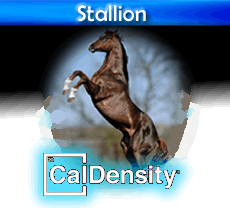 CalDensity was originally designed for race, performance and breeding horses and because of its success we created an expanded product line, Want A Snack. Want A Snack products were developed for racing canines, endurance canines, beloved household canines, camels, breeding and racing pigeons. See the Difference! Ask our company Representative for more information on this revolutionary product. Read Ronnie Stewarts Owner Double S Farm, Stallion Farm experience with Caldensity Stallion.